Unlike other house pets, our aquatic buddies can’t really ask for food. Disciplined and routine feeding times are extremely important in keeping fishes healthy and happy. It’s important that you follow a proper food regimen to keep the fishes in good sound health. Well, it may sound easy but in reality, following a regimen is quite tough. Sometimes we’re out working late, stuck at a party or enjoying a nice summer holiday. But, what happens to the fishes then? Who will take care of them? An automatic fish feeder is an absolute Godsend to overcome situations like this. In our busy hectic life often times it’s almost impossible to stick to a regular routine. 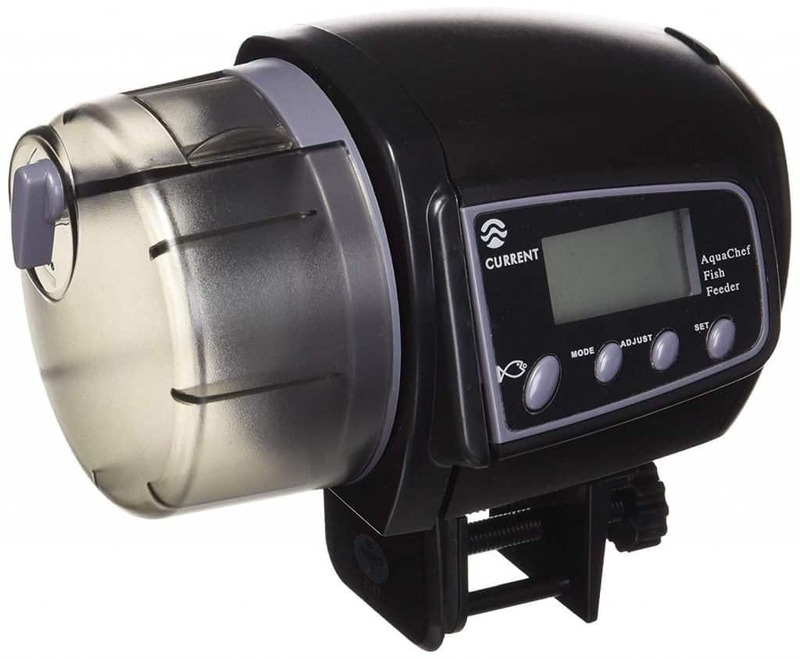 The automatic fish feeder provides food to the fishes in a regular interval. There are many automatic fish feeders in the market. However, the performance and quality vary among them. In this article, we will be reviewing the best automatic fish feeders that will help you maintain a healthy lifestyle for your aquatic species. 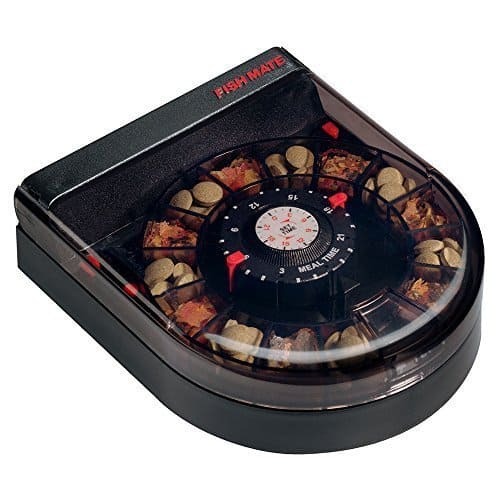 Let’s take a quick look at our top picks of automatic fish feeders. The EHEIM Automatic Feeding Unit is one of the best automatic feeders out there. Once you get your hands on this bad boy, you can be quite worry-free about feeding the fishes. It has a super easy operating system and it can be programmed easily according to your needs. EHEIM auto feeder has a very sturdy build quality. It’s a super simple device that features an LCD display. You can program it to deliver food up to 8 times a day. It enables you to pick the amount of portion to be delivered on each feeding. This device is a perfect fit for you if you have multiple aquatic species with different dietary needs. It has a drum volume of 100ml and it can dispense multiple types of foods. The transparent drum enables you to keep a track on how much is fed to the fishes and the amount left. It offers a super easy installation process and it’s powered with two AA batteries. There’s also a guideline given with the device to help with the installation and usage. On top of that, EHEIM also offers a 3-year warranty with this device. If you’re going for a vacation or you have a hectic lifestyle then give the Fish Mate F14 Aquarium Fish Feeder a try as it will serve up to fourteen individual meals while you’re away. It’s suitable for feeding both tropical and cold water fishes. The Fish Mate F14 has a very compact size. This might not be suitable if you have a large tank and you’re willing to feed a lot of fishes. This feeder is more suitable for small to medium sized tanks. You can also use two or mode feeders if the tank size is above 150 liters. 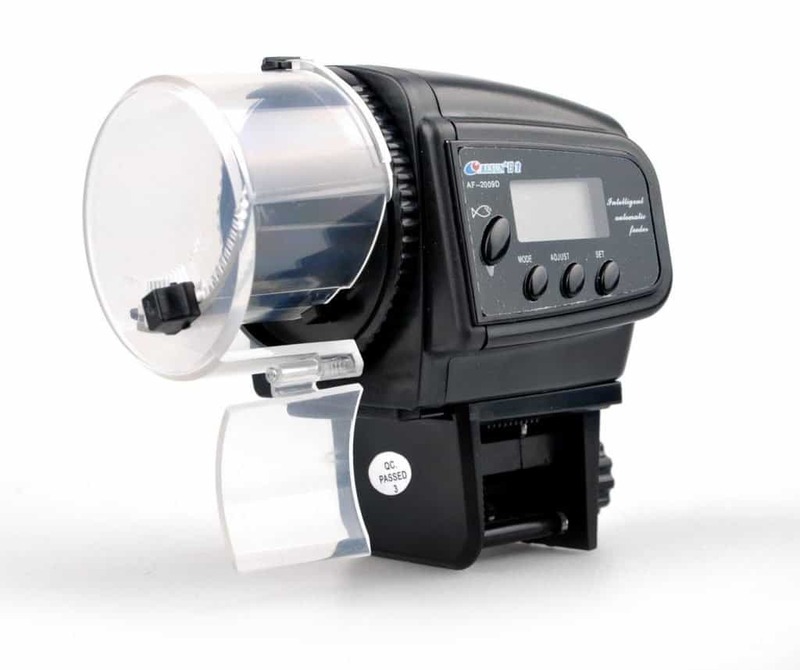 Fish Mate Feeder has a super reliable quartz timer and it can deliver from one to four meals per day. You can choose the time settings to ensure that the fishes are fed in an optimum amount with a proper interval. There are small slots assigned for each meal where you can mix different sorts of food to meet the nutritional value of your marine friends. When the food is stored for a long time, there’s a high chance it will get stale or damp with time. This device features an airline to attach an air pump that will blow dry air to keep the foods dry and crunchy. 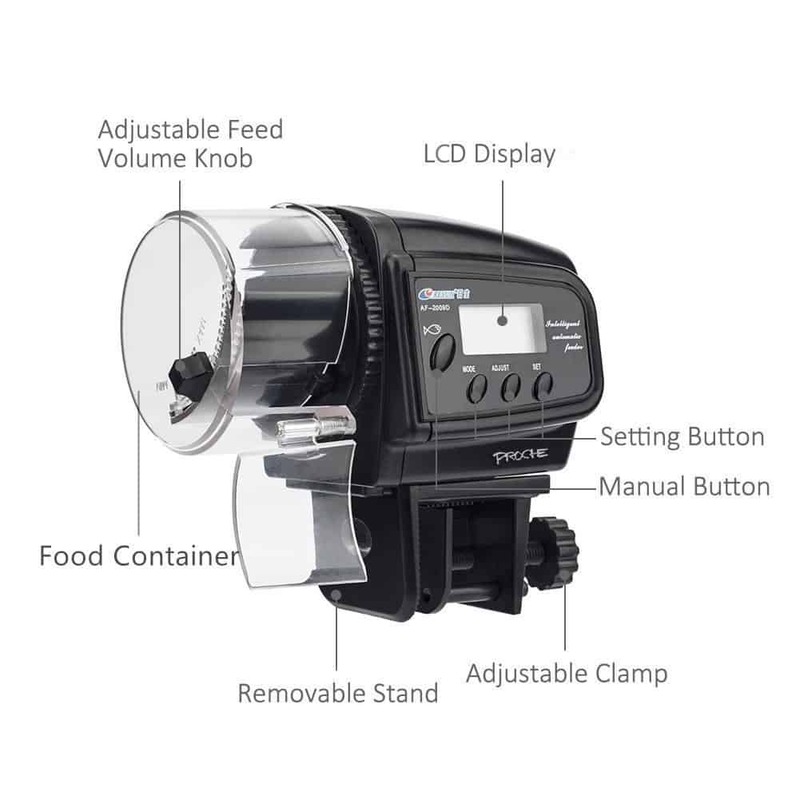 The Current USA 3860 Aquachef Automatic Fish Feeder is another superb automatic fish feeder that does an excellent job in feeding the marine species. It has a built-in timer that enables you to set up to four feeding sessions each day. This device is powered by two AA batteries and the LCD screen gives a clear picture of the settings that you want. 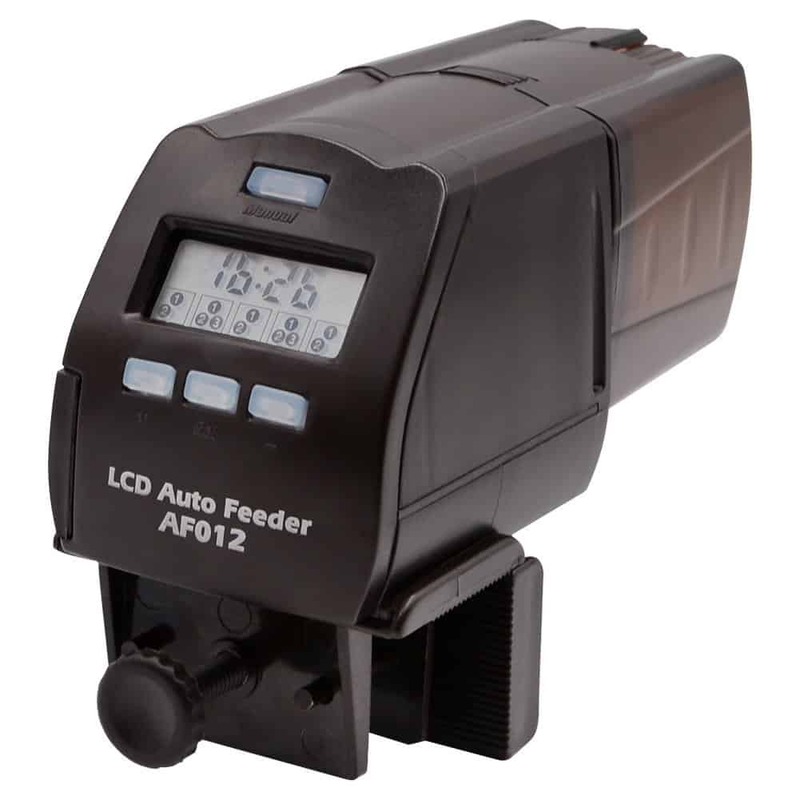 The Aquachef feeder has a sleek matte black finish that will enhance the looks of your aquarium. It has super easy installation process and its adjustable clamp allows it to be mounted in all sort of aquariums. Even if you’re a going for a long holiday, feeding your fishes will not be a bother anymore as this feeder can hold up to 35 grams of food which will keep the fishes occupied for quite a few days. It features an adjustable feed door which enables you to manage the amount of food you want to dispense at each serving. It can effectively hold all sorts of foods such as pellets, flakes, etc. 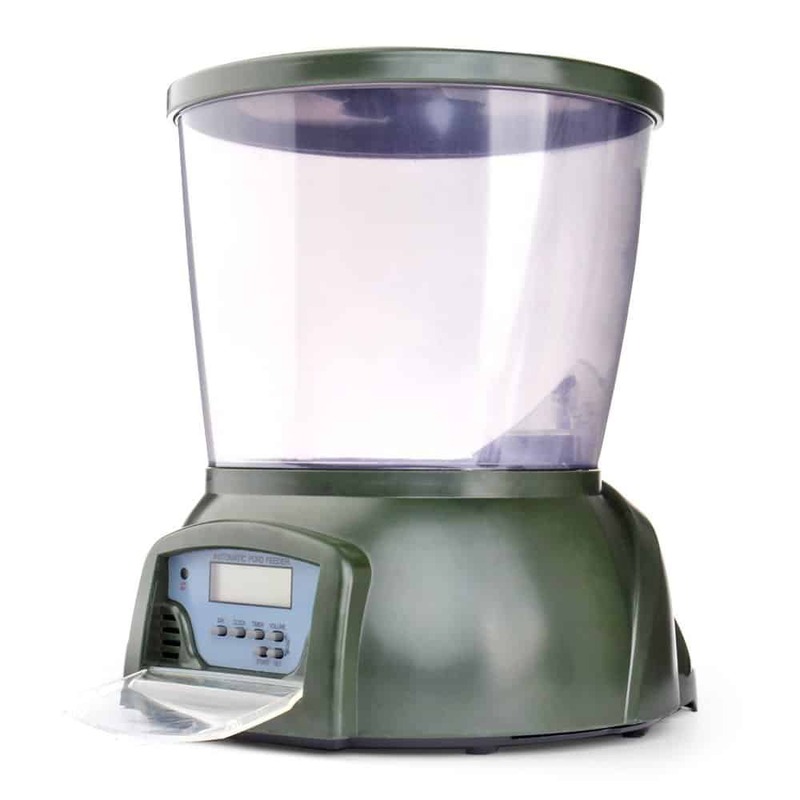 If you’re looking for a high-quality budget-friendly fish feeder then get your hands on the eBo Trade Automatic fish feeder. This device can provide food up to four times a day and you can easily choose the time interval between the feedings. Installing the eBoTrade fish feeder is quite easy as it doesn’t involve any complicated system. It has a small compact size that can be easily mounted to the aquarium. It comes with a user manual guide that discusses all the necessary steps required to install this device. The device has an adjustable feed lever that allows you to determine how much food you want to be dispensed. It delivers the right amount of food while you’re away so that the fishes don’t starve or get overfed. The eBoTrade is powered by two AAA batteries. The batteries are included with the device and you’ll get a notification on the LCD monitor before the battery is about to run out. There is a ventilation system that makes sure the foods stay dry and the moisture-resistant hopper ensures that the food doesn’t dampen up with time. If you’re looking for a versatile fish feeder with tons of amazing features then take a look at the Proche Digital Fish Feeder. It features a super easy adjustable slider that enables you to regulate the amount of food dispersed in each serving. It can provide up to four feedings a day with a 1-2 rotation each time. You’ll get a manual guideline along with the device which will help you set up the device. It offers two installation methods. You can either fix the feeder to the tank wall using the holder or you can paste the feeder to the tank cover using a double sided sticker. The timing for food dispersion can easily be set according to your preference. It can disperse multiple kinds of foods such as pellets, strings, flakes, etc. 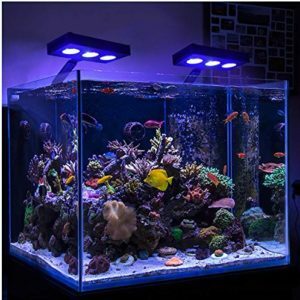 It’s perfect for medium-sized fish tanks with a number of marine species. The device is powered by two AAA batteries that can last up to 3 months with continuous uses. It has a clear LCD screen that notifies when the battery is going down. The AQQEF Automatic Fish Feeder has a very light and compact design that will not occupy much space in the aquarium. The drum holds up t 150ml of food. This amount is enough amount of food that will let you have a nice holiday without having to worry about the fishes. It has a super easy installation process and setting up this fish feeder is easy as a breeze. It can be set up on any type of tank, however, make sure you install the device away from water. It can dispense up to 5 meals per day and 3 rotations per meal. You can easily set the timer up according to your preferred routine and the device will take care of the rest. It’s powered by two AA batteries. However, the batteries need to be bought separately as they don’t come with the package. It also features a large LCD screen and splash-proof buttons. The batteries need to be replaced once the display gets hazy and the feeding cycles should be reset after changing the batteries. The Flexzion Automatic Fish Food Feeder is an amazing option for the people who have a large tank or pond and going for a long vacation. It has a huge tank that can hold up to a whopping 1.6 kg of food that will surely last a very long time. You can program this device to feed your marine buddies for 1 to 99 days. So, taking a long vacation wouldn’t be a problem anymore. The Flexzion Fish Feeder has a very simple installation process. It can be programmed to provide food for up to 4 times a day. The portion size is adjustable and it can be set up according to your preferred routine. It features anti-clog and anti-jam system so that the foods don’t get clogged up while you’re away. It’s powered with 4 C type batteries which need to be bought separately. The large LCD display panel enables you to set up the feeding time and it also indicates if the battery runs down. Despite the large size, it has very simple cleaning procedures. The device can be dissembled from the bottom for cleaning. Well, now that you’re aware of the best automatic fish feeders in the market, it’s high time you make the ultimate decision. However, only knowing about the best automatic feeders isn’t sufficient. There are several major factors that play crucial roles which should be taken into concern. 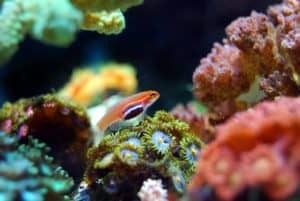 An aquarium needs lots of equipment to keep the fishes healthy and provide them with an ambient environment. When the tank is already loaded with a number of devices, it’s important that you don’t put more stress on it by putting heavy-weight devices. 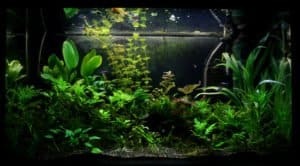 Make sure the feeder that you choose is lightweight and compact in size so that it can easily fit in the aquarium without putting much stress on it. Choose a feeder with a food holder that is compatible with your tank size. However, if you own a large tank, having a small feeder will not be sufficient enough to feed all the fishes. The key to getting the best service out of the automatic feeder is to choose a device that has the highest amount of ease of use. Some automatic fish feeders are super easy to install and there are some who are an utter nightmare. Get a fish feeder that includes a manual guideline so that you can easily make the best use of it. Choose a device that has a digital display with as they’ll help you to set the timing and give reminders when the battery is down. This feature is one of the most vital features to consider when it comes about automatic fish feeder. The purpose of getting an automatic feeder is to keep the fishes healthy and well-fed while you’re away. Fishes should be fed at certain time intervals in a small amount without feeding them heavily at once. Feeding the fishes couple of times a day with small portions tend to keep them healthier. The feeding frequency tells you how often you want the food to be dispensed. This varies among the feeders and the number ranges between two to eight feedings per day. It’s important that you choose the optimum range so that you don’t starve the fishes or overfeed them. Observe and take note of how much the fishes can eat and choose the timings accordingly. The amount to be dispersed on each serving is also equally important. Make sure the feeder that you choose delivers the appropriate portion. The dry air circulation inside the food holder ensures that the food doesn’t get damp or spoilt due to the moisture content in the atmosphere. It’s extremely important to check the amount of moisture control the feeder offers before making the purchase. Some feeders offer excellent holding capacity. However, it will be no good it isn’t equipped with proper ventilation as the food will go rotten when it comes in contact with moisture and air. What good would an automatic feeder be if it comes with poor battery life? Suppose you left for a long vacation only to come home to a tank full of dead fishes because they weren’t fed as the battery of the feeder died. An absolute nightmare, right? The battery life of the feeder is extremely important as that determines how long the device will run and provide food to the fishes without any interruption. To avoid such mishaps it’s extremely important to feeders with a proper battery that will run for days and months. Most automatic fish feeders equip AA, AAA or Type C batteries. Sometimes the batteries are included with the package and sometimes they need to be bought separately. However, these batteries are quite inexpensive and widely available. On top of that, for most feeders, you’ll also get a notification on the digitalized screen that the battery is running down. Without the automatic feeder, it requires you to be present to feed the fishes. However, most of the times this is not possible due to our hectic lifestyles. Fishes, specially juvenile ones need to be fed in small portions, multiple times a day to keep them healthy. It is almost quite impossible to follow a regular routine for being very troublesome. An automatic fish feeders enable you to be worry-free and even allows you to take long vacations as they’ll take care of the feeding business. Sometimes we mistakenly overfeed or underfeed our fishes. We are only human, we make mistakes. An automatic fish feeder is pre-programmed with the right amount of food to provide so that the fishes don’t starve or get overfed. Overfeeding causes more waster build-up in the tank and that is one of the major causes of diseases. With an automatic feeder handy, you’ll not have to worry about any of these problems and your fishes can live a healthy happy life. The more they eat, the more they’ll excrete. Automatic feeders don’t disperse a large amount of food at once. 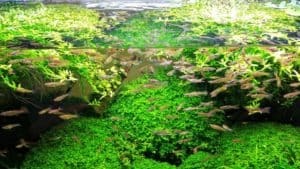 They disperse a small amount of food in multiple serving so that the fishes can live a healthier lifestyle. You’re probably worried about the feeding regimen if you have a number of marine species with different food habits. An automatic fish feeder can hold multiple types of food so that all the species can be fed. 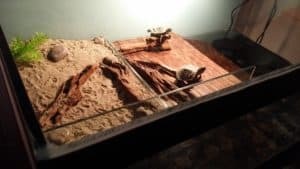 It’s an aquarists’ nightmare to come home and find the fishes starved to death. The feeder will stop working when it’ll run out of battery. So, check whether the battery is sufficient if you’re going on a long vacation. Make sure the device runs till you come back home. If the feeder doesn’t incorporate a fan to keep the moisture and air away then the food will eventually damp and rot. Make sure you get a well-constructed model that will keep the foods fresh for days. Automatic fish feeders are nothing short of a lifesaver and they are really helpful to keep the fishes healthy. There are countless automatic feeders in the market but not all will provide the same amount of performance. In this article, we have reviewed the best automatic fish feeders so that you can be absolutely worry-free while enjoying a nice vacation or having a hectic day at the office. These feeders not only provide food but also provide it in an ample amount so that the fishes can stay healthy and happy. Make sure you get your hands on the best automatic fish feeder to keep the fishes in their top form.